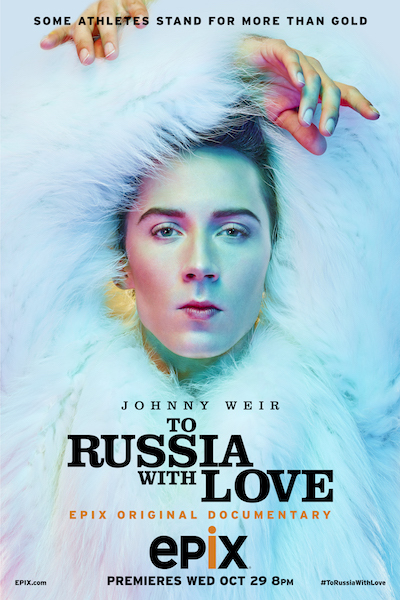 To Russia With Love explores human rights through the lens of LGBT athletes, with iconoclastic athlete and commentator Johnny Weir serving as the viewers’ guide into this world. The 90 minute film examines the experiences of Olympic legends Billie Jean King and Greg Louganis as well as the next generation of LGBT athletes who participated in the 2014 Olympic Games in Sochi, Russia. Shooting worldwide in locations as diverse as Sochi, New York City, Calgary, Toronto, St. Petersburg and Moscow, the film follows these athletes from the ice to the slopes as they bear the brunt of constant media questioning about Russia’s anti-gay laws. In addition to Olympic sports legends, 2014 Olympians and Olympic hopefuls included in the film are snowboarders Belle Brockhoff and Simona Meiler, speed skaters Anastasia Bucsis and Blake Skjellerup, four-time gold medal winning hockey player Charline Labonté, as well as notable sports personalities such as Calgary Flames President of Hockey Operations and USA Hockey personnel director Brian Burke, Olympic gold medalist swimmer Mark Tewksbury and Russian Open Games’ Konstantin Yablotskiy and Elvina Yuvakaeva. To Russia With Love also features interviews and commentary from David Remnick, editor-in-chief of The New Yorker, Golden Globe-nominated actor and activist Stephen Fry and the Brooklyn Nets’ Jason Collins.